No country comes to the rescue of others like the United States of America. We are a decent, compassionate, and giving people. We pour more resources into world-wide disasters than nearly all other countries combined. Of course, when it comes to helping our own family, Americans simply rock. We are an unstoppable force of decency. In our darkest hours, Americans shine most brightly. When an Ocean fell from the sky and landed in Southeast Texas, it gave rise to a citizens’ Navy. The sailors are citizens of every race, color and creed. They are motor-boating, paddling, and sailing, house-to-house to save their fellow Americans in Houston and along the Texas coast. They are the best of America. 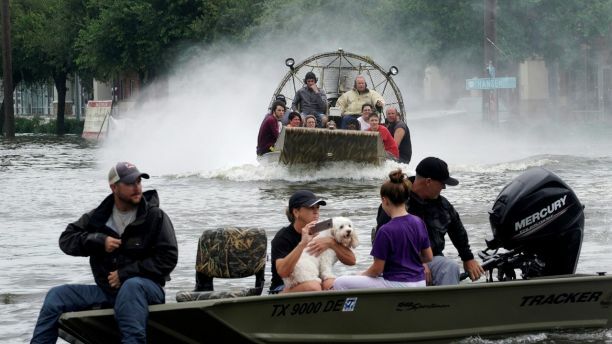 The call to citizens to help their fellow man went wide and far, and pictures of Texans caravanning to the area towing their boats have inspired us all. Nothing speaks louder than a convoy of compassion. The heroes out there are black, white, brown and every color you imagine. They are the atheist and the churchgoers. They are single, married, straight, gay, trans. They are every label anyone has ever dreamed up to divide us. Today, however they are the best of all … Americans. Labels don’t save Americans … Americans save Americans. Many Americans have been sending money. Some have left their jobs and traveled hundreds of miles to help. Others are tweeting and retweeting emergency cries for help, donation links, and helpful information for first responders. 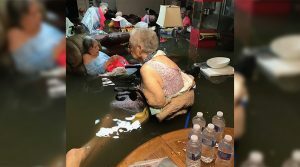 These elderly women were rescued after the nursing home’s owner called her daughter in another state, and the daughter sent out a plea for help via social media. 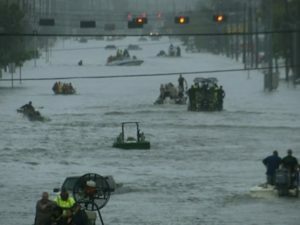 On the ground … or as it is … in the water … Houstonians and people all across the vast coast are doing whatever they can to save a neighbor or a stranger. No one is asking for whom you voted. No one is asking your party, your preference, your background. No one wants to see your ID or your papers. No one wants to know if you are a blue American or a red American. In the giant ocean of despair that became Houston and every community around it, sails a thousand ships of decency. That’s what we do. That’s who we are. And, this is how every American needs to approach every single day, every single debate, and every single challenge … as a unified America. The people below … and above … one people … one color … It’s hue is a American. 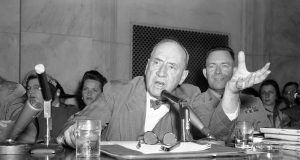 Courage, decency, civility, and unity … the most prominent characteristics of great Americans. Unfortunately, it’s a big country, and not every American has yet to embrace unity. For the cynics and opportunists, natural disasters, death, destruction, and the agony of lives in total desperation is a chance to divide. We see it in a sneering post assigning blame, spewing hate, and reminding us all that the poison of politics still flows in little creeks outside the vast ocean of compassion. Twitter and social media help us find the hate. We need to find the hate. We see people share their hate and thrive on it. They love the political division, and they see tragedy as opportunity. Their angry voices seem loud. Don’t be fooled though … they are in the minority in this great land. Their message is empty … and hate can never swim in the strong currents of decency. That’s why we find clusters of haters in small, stench-ridden little ponds. When we do, we shine the light of decency upon them and let that light disinfect them. Know too that political opportunism and indecency are not the voting block of any one party. It is a block of ignorance, and it lives in both major parties. Those parties should throw their haters overboard, for the Navy of decency has no quarter for them. While ordinary Americans battle the elements and risk life and limb to save a stranger, a pet, or a friend … doing all they can to give hope to people who have none … others are ripping America to shreds. We see you … and America is better than you. Yesterday, while mother nature claimed lives and a citizen navy fought to save them against 1000 year flood, modern day fascist, dragoons, clad like ISIS, attacked and beat a fellow citizen outside an institution of higher learning. These are the #altleft that some insist do not exist. This is just one side of hate … but it is so small. Like the Nazis and the other nut cases, they are not America. Nothing makes a hater look smaller than simple hero. Nothing robs the divider and hater of his or her power more than simple act of goodness, tolerance, heroism, and selflessness. Nothing is more compelling than a stranger risking his life for another … to give life and voice to a fellow citizen … while the haters try to beat tolerance into those they can’t tolerate. Houston’s Navy is impressive. It’s huge. It’s inspirational. However, it is just one very tiny example of who we are as Americans. When we make the choice to push aside the politics of division and focus on each other, Americans are the greatest force for good the world has ever known. In Houston, they are drowning out the hate and division. In unity, they will rebuild. Together they will be stronger. 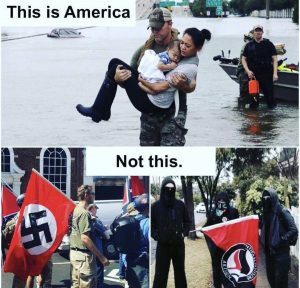 They are #Houstonstrong because we are #Americanstrong. In Houston and across the ravaged coast, no one is rescuing labels. They are saving people. That’s good for the American soul. We must nurture our inner angels with acts of human kindness. It’s our job to heed the lessons of the heroes. Flying under one flag … can Americans unite behind the Houston Navy?